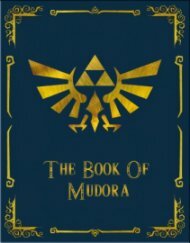 Hyrule is truly a place that is rich in history, and sometimes, it can be a little confusing knowing what happend when and where. This tome sets out to avert any such confusion and to help you understand and enjoy the land's numerous and interesting stories. There are timelines, a historical summary, guides to characters, maps and much more including guest articles and theories. Remember a lot of the ideas and information contained in here is merely guesswork using the games, comics and cartoons as sources, plus my own ideas. This is merely North Castle's interpretation of Hyrule from the fragments given to me by Nintendo. If you have your own theory, don't hesitate to send it in and it will duly be added. To read a chapter, simply click on the links below. 6. Timeline by Ronald D. Roberts Jr. This page was created by Juliet A. Singleton © 1998-2009. All rights reserved.